What a great reminder message using spring flowers as an analogy. Life is not a competition even though it often feels that way. We each have come with a life purpose unique to us. While we need others to complete it, they can not complete it for us or us theirs. Each of us stand in our own beauty completing the landscape. 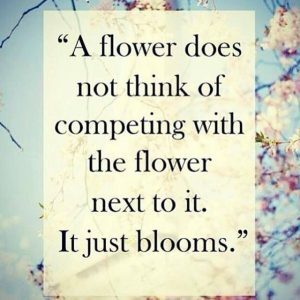 We are reminded today to stay on OUR path and not get sucked into competing with others. It is on it where we truly shine and where we are the best that we can be. -Shine in the light of your own purpose.